Sirhan Bishara Sirhan (Arabic, born March 19, 1944) is a Palestinian who was convicted for the assassination of United States Senator Robert F. Kennedy. He is serving a life sentence at Pleasant Valley State Prison, California...Sirhan was a Jordanian citizen in Jerusalem born to a Palestinian Christian family. When he was 12, his family emigrated, moving briefly to New York, and then to California. He attended Eliot Junior High School (now known as Charles W. Eliot Middle School) in Altadena, California, John Muir High School and Pasadena City College. 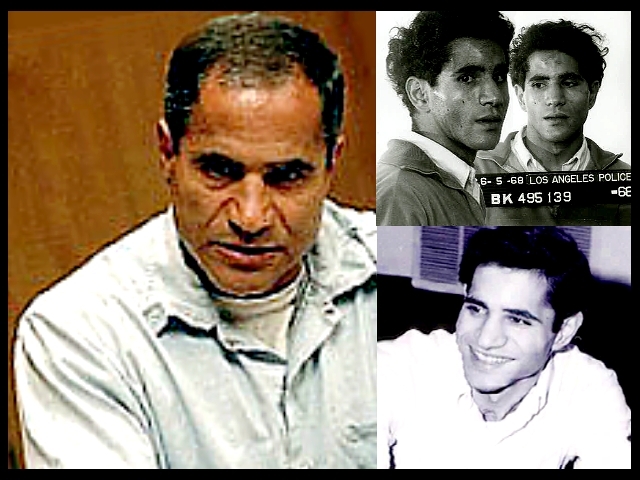 Sirhan's father Bishara was characterized as a stern man who often beat his sons harshly, and shortly after the family's move to California, he would return alone to the Middle East. As an adult, he changed church denominations several times, joining Baptist and Seventh-day Adventist churches, and also allegedly dabbling in the occult. He was employed as a stable boy in 1965 at the Santa Anita race track in Arcadia, California...In a 1980 transcripted interview with M.T. Mehdi, Sirhan claimed his actions were fueled by liquor and anger. He then complained that the parole board was not taking these "mitigating" circumstances into account when they continually denied his parole. On May 10, 1982, Sirhan told the parole board: "I sincerely believe that if Robert Kennedy were alive today, I believe he would not countenance singling me out for this kind of treatment. I think he would be among the first to say that, however horrible the deed I committed 14 years ago was, that it should not be the cause for denying me equal treatment under the laws of this country." A parole hearing for Sirhan is now scheduled every five years. On March 2, 2011, after 42 years in prison, Sirhan's 14th parole hearing was held, with Sirhan represented by his current attorney, William Francis Pepper. At his parole hearing, Sirhan testified that he continues to have no memory of the assasination nor of any details of his 1969 trial and confession. His parole was denied on the basis that Sirhan still does not understand the full ramifications of his crime. (Wikepedia).